Your pulse is racing, muscles tense and ready for action, eyes darting every direction, and you have a burning feeling in your gut that is growing. Ready for a fight, Miranda is confident she can win because in addition to all that she can actually call on fire. A perfect secret weapon to have, especially when placed in dangerous situations while fighting for your husband. Miranda is an incredible woman. Besides her otherworldly talent she knows how to fight, knows her way around the seedier side of London, has a pure heart, and has fallen in love. As interesting as Miranda is, it is the beastly man she lost her heart to who truly steals the spotlight. A man in a mask is an enigma, and Archer is that and then some. The mystery behind the mask will have you wondering and guessing till the end. It is more than just the mystery surrounding Archer that grabs you so tightly. It is his determination to have Miranda even though he knows it puts her life in danger, and the way he tries to keep his heart protected and aloof in yet another attempt to keep her out of harms way. When the inevitable happens and Miranda ends up in the thick of it you see Archer open up in a way that makes him irresistibly real. 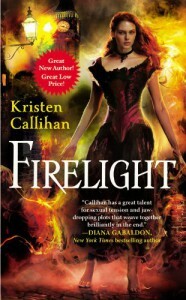 Firelight has a plot line with strong steady flow that pulls you along as fast as you can read. From page one to the very well crafted end, you will not want to put this book down. Callihan has brought paranormal to historical London in a fresh new way. Firelight will blow you away and leave you waiting for the next book in the Darkest London series.